. . . and why do they always say such nice things about him? Actually, he isn’t JACK Momple. To give him his full name, it’s GERALD Cyril Peter Momple. And it’s pronounced Mom-play, if you don’t mind. He is a drummer with a band. 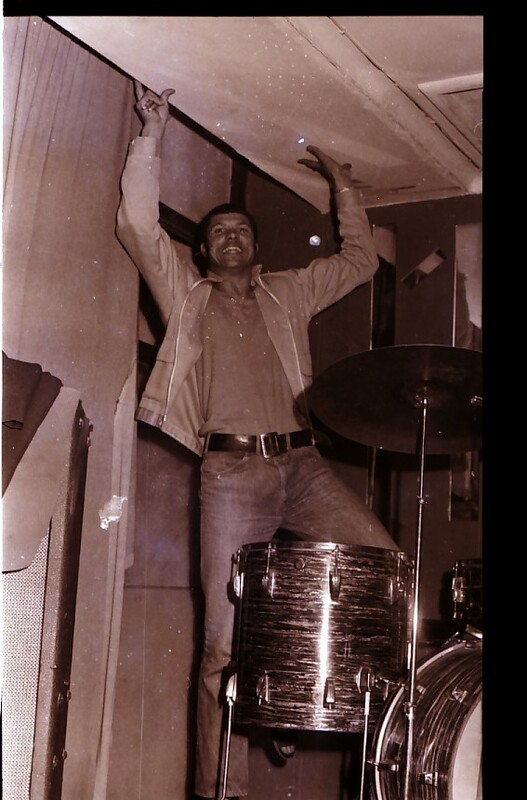 Name a band, any decent band, in Cape Town over the last 45 years or so, and chances are, Jack would have played with them or stood in for a sick or unavailable regular drummer. He has become a fixture on the Cape Town music scene and regarded has one of the legends. At 68 years of age, he should be. He’s done his time and deserves all the accolades he can get. But Jack very nearly didn’t make it to Cape Town. Way back in ’67, when the local pop world was all agog with The Flames and Invaders, he was a Durban laaitie who was playing small-time gigs. But he craved a bigger stage. “I was playing with the Chayn Gang with Henri Donjeany and Baby Duval and we decided Cape Town was where the action was,” Jack recalled this week. Jack and the band had a short stay in Cape Town before heading back home. But the Cape Flats bug had bitten. A fixture on the Cape Town scene, Jack Momple has been around for close to 50 years. This was taken way back in the day. 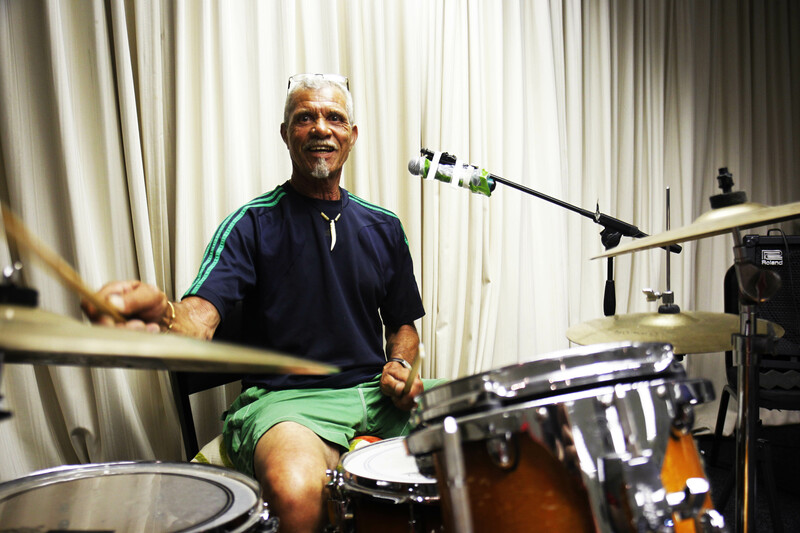 He had given up his job as an apprentice carpet weaver – yes, a carpet weaver – and headed back south on his own to the Cape Flats, an ambitious drummer who spoke English and Zulu fluently, but no Afrikaans. His young family joined him soon after. “It was tough at first but nowadays I can hold my own and strangely enough, my Zulu is almost non-existent,” he says. This week Jack had rehearsals for the Pacific Express Reunion and he caught up with another original member of the group, Issy Ariefdien, for the first time in about 20 years. When Jack settled in Cape Town, he hooked up for a while with another Durban group, The Exotics, who had made Cape Town their base. And so started his journey which today finds him among the drumming elite on the music scene. But did he always want to be a drummer? No, not actually,” he says. “I started with a group called The Scoots as a rhythm guitarist but we had a drummer who had a bit of difficulty keeping up and I was in his ear constantly telling him how to do it. “The other members gave him the flick and told me I might as well do the drumming. Although Jack is comfortable with any genre and is happy to play whatever is in front of him, it is in the jazz genre that he probably receives the most plaudits. “I’ve always had a leaning towards jazz. My father and uncle liked it and early on in my stay in Cape Town I lived with Sammy Hartman’s family where it was all about jazz.” He has a particularly liking for the music of Miles Davis’s guitarist John Schofield, bassist Jaco Pistorius and pianist Chick Corea. Jack’s long career has seen him back hundreds of local artists and quite a few international stars from he says he learnt a lot through their professionalism. “Among the local artists, I found Zayn Adam the easiest to work with and Leslie Kleinsmith for his sheer attention to detail and knowing what he wanted. While he is optimistic about the state of music presently, he is not a big fan of digital and computer-generated music although he feels it is mainly in Johannesburg where it is prevalent. Has he “generated” any of his own compositions? Yes, he has one composition that he can call his own and it gives an idea of just how “Capey” Jack has become. Jack featured on all four Cape Jazz CDs that have been released on Paddy Lee Thorp’s Mountain Record’s label. The latest offering, Musical Democracy, is one of the most popular CDs in Cape Town at the moment, getting regular airtime on local jazz stations. Jack is nearing 70, yet, he says, he has no intention of slowing down. In his long and enduring career there are quite a few things he likes talking about . . . like his times playing with hornmen Robbie Jansen and Basil Coetzee. Whilst Jack’s creative juices generally flow when he has his drumsticks in his hands, has developed a liking for another art form — carving-sculpting figurines. “When I was on the road up north many, many years ago, we had lots of time on our hands during the day, so we hung out with local artists. Myself, Basil and Robbie were quite taken with how they could create something so beautiful from a piece of soapstone or wood. Jack’s a father, grandfather, great-grandfather. In all respects, he is a senior citizen. But don’t tell him that. He is quite at home playing with the younger generation. Jack Momple . . . getting ready for the Pacific Express Reunion. Nice Warren, good hearing some of the history. Jack is an amazing drummer to work with, particularly in the studio. He plays the song, not just hammering out the beat. And as far a composing goes, he brought so much to the table on many of the songs he recorded, not only the CJB project, but Robbie, Basil and many others. Rafs, good to hear from you. I wouldn’t mind getting a number off you for Henri Donjeany (if you can get it off his brother). Well written brother. So many memories….., good ones. Why thank you, Kim. You’re much too kind.